Quad Stack Battery Extractors (BE-QS) from BHS offer the greatest combination of space-saving design, efficiency, and safety for fleets with more than 300 batteries. With battery change-outs averaging just a few minutes per lift truck, a BE-QS system can improve battery room efficiency significantly, freeing forklifts to complete more material handling tasks. 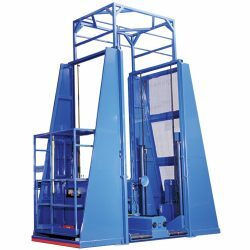 The advanced BHS lift system incorporates four hydraulic lift cylinders with a four-point equalization system. This combination keeps the battery carriage moving smoothly and evenly, while the exclusive Non-Inter-Flow hydraulic manifold routes power to adjust to the shifting weight of a battery transfer. Battery beds ensure load stability during travel with five hydraulic-powered rollers supported by six additional idler rollers. The careful spacing of these rollers prevents damage to battery cases and supports the 10,000 pound load capacity that allows the BE-QS to bear the industry’s heaviest batteries safely. To learn more about forklift battery changers from BHS, call our sales team at 1.800.BHS.9500, or fill out our Info Request form here.